The Strasburg Metropolitan Parks & Recreation District was founded in 1974 by a group of forward-thinking individuals who were interested in setting the stage for an organized recreation district. In 2014, Strasburg Parks & Recreation District celebrated its 40-YEAR-ANNIVERSARY! For more information about the District, please see ‘Frequently Asked Questions’ below. Please call if you have a club or program that should be listed here! The mission of the “Friends of Strasburg Parks and Rec” is to improve the quality of life for all Strasburg residents by generating funding and support for projects and programs that enhance and supplement activities and scholarships offered through the Strasburg Parks and Recreation District. The ‘Friends’ organization meets quarterly and organizes several fundraising activities throughout the year. The organization also provides an annual scholarship to a Strasburg High School student in addition to the youth scholarships offered through the District. If you are interested in participating in the organization please contact the office, 303-622-4260. We are always looking for community members interested in helping! Have you heard about our Youth Scholarship program? 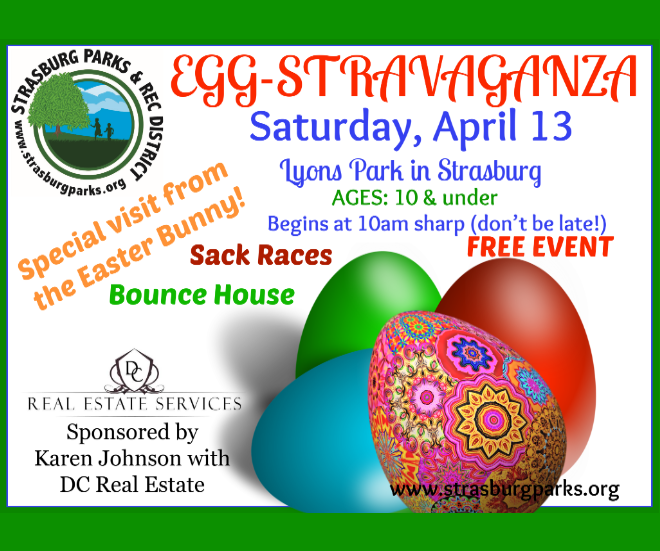 It provides recreational opportunities to financially challenged families and is made possible by the fundraising efforts of the ‘Friends of Strasburg Parks & Rec District’ and private donations. If you would like more information, a scholarship application form, or would like to make a tax deductible donation to the program, please contact the District. 1) How do I register for programs*? There are multiple ways to register for classes and programs. Our convenient online registration system is available 24/7. Or visit us at 1932 Burton Street in Strasburg, Monday-Thursday from 8:30am-5:30pm. All participants and volunteers must sign an original registration waiver. Any outstanding balance owed to the District must be paid in full before registration in any other activity will be allowed. All registrations need to be completed one week prior to the start date of the program, or as otherwise noted. A $10 per person late registration fee will be charged for late sign-ups (if the program is not full).There will be a $20 charge for all returned checks, plus the bank fee. 2) Do you have a Code of Conduct for the District? Patrons are encouraged to behave in an appropriate manner and should act in a way that will not injure another person physically or emotionally. Individuals who do not abide by facility and program standards may be asked to leave the facility and/or withdraw from a program. Actions interfering with or disrupting the SMPRD staff while trying to provide a safe and secure family environment will be cause for expulsion from all District facilities. 3) How is the Strasburg Metro Parks & Rec District currently funded? Strasburg Metro Parks & Recreation District is funded by: Property Taxes, Specific Ownership Tax (“SOT”; from motor vehicle sales, etc. ), Lottery Proceeds (Conservation Trust Funds), Activity Fees, Sponsorships, and Competitive Grants. PROPERTY TAXES, SOTs, and LOTTERY PROCEEDS are used to maintain and operate the District. This includes (but is not limited to) paying staff, parks maintenance and landscaping, maintenance, equipment, building and parks facility upkeep and repair. The current mill levy for the District is 5.010 mills per thousand dollars of assessed valuation. The District has NOT increased the mill levy in more than 20 years! In fact, due to the TABOR Amendment, the District mill levy declined slightly in the early 1990s. ACTIVITY FEES and SPONSORSHIPS are used to conduct recreational activities, enrichment programs, and special events. These programs are generally financially “break-even” events, paying for instructors and associated costs (uniforms, equipment, etc. ), and are designed to be self-funding. Major park improvements, as well as athletic facility installation and improvements have been funded by Open Space GRANTS from Adams and Arapahoe Counties, through a competitive process when such funds are available. The District’s finances are audited annually in accordance with State law; with the District’s Auditor has found no issues as to the manner in which the Board and staff have handled these public funds. A copy of the latest audit is available in the District office. 4) What is the difference between ‘In District’ and ‘Out of District’? The boundaries of Strasburg Parks & Recreation District mirror the boundaries of the Strasburg School District, with some exceptions for agricultural land within and surrounding Strasburg. Those located outside of the boundaries are considered ‘out-of-district’ and do not pay property taxes to the District and therefore are charged a higher rate for activities. 5) What is your cancellation policy? Since class fees are calculated on a minimum number of participants, if the set minimum is not met for a class, it is canceled. All registered participants are notified by phone or email and receive a transfer or refund. Classes must reach the minimum three days prior to the first day of class, unless a specific registration deadline is noted. A 100% program registration fee refund will be issued only if a request for a refund is made no less than three business days prior to the start date of the program. A 50% program registration fee refund will be issued only if the request is made prior to the second scheduled meeting of the program. After the second scheduled program meeting, there will be no refunds issued.